I’m turning 27 in a couple of weeks and I am NOT happy about it. I never thought I’d be one of those people who dreaded their birthday, but this year, I’m just not that into it. When I was little I could not WAIT to turn 26. For me, 26 was it. That was a mature, happy age. 27 definitely puts me into my “Late Twenties” and that’s downright scary. How did that happen? Maybe it’s been all that thinking about it that made me reflect a little bit on my life. Truth is, I’m finally totally content. I have a job I love, a house I’m proud of, a husband I adore, and a (somewhat) healthy lifestyle to boot —and I’ve been lucky enough to do all the traveling that I waited my whole life to do. Yea. I’m pretty lucky. 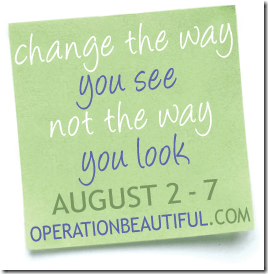 As part of the Operation Beautiful movement, I decided to share my newfound thoughts on the blog. Here’s a few things I’ve been doing differently and I’m loving it! I love to read. I love getting lost in a book and staying up really late to finish a book. So if I love it so much, why have not read a single book in months?! Last week, I picked up “Sarah’s Key” by Tatiana de Rosnay and I read the whole thing in 6 days. I didn’t watch much TV and left some of my chores by the wayside and it was glorious! I noticed right away how much calmer my demeanor was. So relaxing. I’m back into marathon training season again! I love having a reason to get out and run. I always feel productive when I got a long run in—even if nothing else gets done. It feels good to put me and my body ahead of everything else sometimes (in moderation of course!) We’ve also been walking more in general lately. I love our 3-mile after dinner walks through the neighborhood. It helps Irving and I connect, chat with friends, and get some fresh air. Can’t argue with that! Ugh, for 27 years, I’ve been a habitual nail biter. It was totally embarrassing and immature and I knew I had to get over it! So I made the decision about four months ago to just quit cold turkey –and it worked! I noticed right away how much I calmed down after that. Biting my nails made me anxious and in turn I kept biting them! It was a horrible circle. But now, they are long and pretty and I am SO proud and happy with them! Erika and I did a Circus Class a couple of weeks ago and it was awesome to let our inhibitions go and hang upside down on a trapeze for a while. I recommend it to anyone who wants to feel alive again. It was awesome. Irving and I are both fans of the motto “A clear desk is a clear mind”. But my little home office has become claustrophobic lately and it’s really unproductive. I can’t get anything done when there’s paper piling up and boxes towering over me. Ew. Look at all these wires I’ve had to look at on my desk for years now! There are so many ‘devices’ that I use on a daily basis! Camera, Garmin, Bluetooth, Phone, Ipod, Blackberry, SD Reader, portable hard drive! So last night, I dragged Irving to Kohl’s and finally bought a Charging Station for all my ‘stuff’. Each thing now has a place! I may have tamed the wires on TOP of the desk… but UNDER was a different story! I also finally installed my ginormous powerstrip! It was almost as tall as ME! Part Two of my project was to fix my ugly bookcase and make it prettier! Better, right? I finally ditched the cardboard boxes. Yuck. So all this stuff together totally made me find happiness that was in there all along. Don’t get me wrong, I’ve always been a happy, out-going person… but now, I feel content too. And that’s a great feeling. awe, thank you so much. That made my day. I’m SO lucky to have friends like you in my life. 🙂 I really am LUCKY! 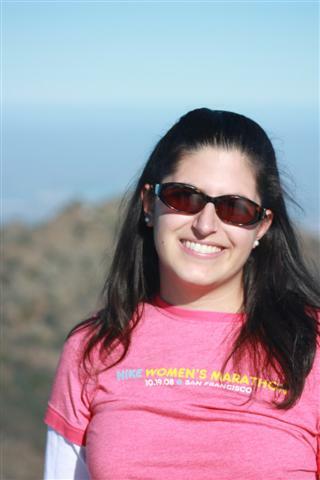 First…I love that you went on a group run and your times were great! That is faster then me …and I’m “running” the whole time! I would love to find a group to do some of my runs with. Also I love this post of yours…I swear I could have written it as it is exactly like me! I dreaded turning 30, 31, and 32 (I actually loved all my teens and 20s)…like super not excited about getting older. But I’m hoping 33 is the changer…I like you…love my life but there is something about getting older that is not my fave. I also love to read and don’t do it nearly as much as I would like. And talk about needing to organize and de-clutter…we are constantly working on it! I also am getting geared back up for some running races…I do love to run and the races keep ya motivated. And trying something new…I am going back to school to become a teacher…which I have been in the finance/insurance/legal world for over 10 years…but yet I am so excited about doing this career change…I think it is really me. Thank you so much. It’s nice to know others can relate! Good luck with your runs. I hope you can find a group to go with. It is a great way to get the milage in. It’s funny how I go faster by adding the walk breaks. I highly recommend it. Thanks for reading!! Good luck with school!